Horizon "working as it should"
The wtf moment this afternoon was provided by Post Office employee Dawn Phillips as she was being cross-examined on her written witness statement by the clamaints' barrister Kathleen Donnelly. Dawn is Team Leader for both Agent Accounting and Santander Banking at the Post Office. Agent Accounting used to be called Agent Debt. Ms Phillips agreed this was a semantic change. Ms Phillips' department chases Subpostmasters for their cash. Ms Donnelly took Ms Phillips through the process for initiating debt recovery against a Subpostmaster. It is now accepted by all parties that there is no option for a Subpostmaster to dispute a discrepancy on Horizon. 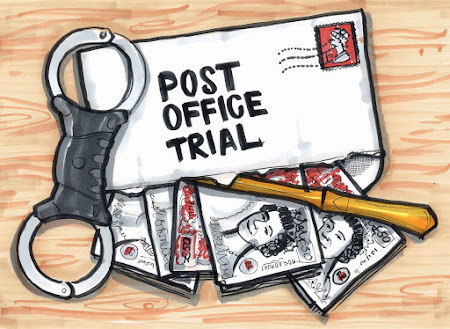 This was a massive bone of contention in the first trial as the Post Office had maintained that to "settle centrally" was the initiation of Horizon's dispute process. Thanks to skilful cross-examination and diligent work by the claimants' legal team, this was exposed as a nonsense. The claimants contended and the judge agreed that raising a dispute within the Post Office system began with a call to the helpline. So how did this sit with the debt recovery department? Ms Phillips had exhibited, as part of her witness statement, the standard debt recovery letter sent out to Subpostmasters who press "settle centrally". After noting the letter does not mention the Subpostmaster's right to dispute what had been "settled centrally", Ms Donnelly asked when the letter would be sent. "We send it on the Monday after, so unless they actually made the error on the last day of their trading period then it's likely that they made the error in the previous few weeks." said Ms Phillips. Unfortunately Ms Donnelly didn't pick Ms Phillips up on her language, which is a shame as it would have been interesting to explore. Ms Philips said it twice: "error". It demonstrated to me, at least, that the default unthinking assumption of the head of debt recovery at the Post Office, is that if a Subpostmaster chooses to settle to cash, "settle centrally" or even raise a dispute, it is a Subpostmaster error. Not a discrepancy, not a disputed sum, but a Subpostmaster error. Ms Donnelly wanted to know if the debt recovery department was interested in whether the Subpostmaster was disputing the error or whether the standard debt recovery letter went out automatically. Ms Phillips explained that her team reviews the list of settle centrallys every Friday, so the letters can go out on Monday. Ms Donnelly wanted to know about disputed discrepancies. Does the helpline [in this case, the NBSC section of it] inform the debt recovery team a discrepancy is in dispute or does the debt recovery team ask NBSC if a sum is in dispute? Q. your team has access to the helpline logs? a dispute in advance of settling centrally? I wouldn't know about it. that. I've never seen one. Q. Well, you also don't look, do you? A. Well, we do regularly check. We check every week. a) send out the debt recovery letters to all of them on Monday? b) see if any had been flagged as disputed on the system? c) manually check with the helpline/NBSC to see if any had disputes attached? "We look for any call in the previous month that could relate to the loss that they have settled. We don't specifically search for settled centrally calls." "So..." wondered Ms Donnelly, "this is an ad hoc process, is it?" "No, it's a weekly standard process." Mrs Donnelly asked about the criteria for finding out if there was a dispute attached to a sum settled centrally. Ms Phillips obliged: the debt recovery team go by the size of the discrepancy. If it's more than, say, £5000 they will check to see if it is disputed. "So you wouldn't bother checking the helpline log for £2,000?" she asked. "It's not a case of not bothering, it's a case of how many have settled centrally and how many are large." came the reply. Ms Phillips appeared to have described a standard process of initiating debt recovery against Subpostmasters (whether their discrepancies are in dispute or not) if the sum was lower than £5000 - occasionally the threshold shifted, but generally it is around the £5K mark. Claiming puzzlement, but possibly out of incredulity, the judge asked Ms Donnelly to take Ms Philips through the process again. As they did so, we let it all sink in. Yup, they really do start debt proceedings in that way. Ms Donnelly asked if anyone audited this system. "Yes," said Ms Phillips, proudly. "We've got an external firm called Traction that we have to report to and attach evidence that we have followed that process every week or month, whatever the actual process is supposed to be." And, wondered Ms Donnelly, do you report which value you have decided to look at the helpline logs for that week? "So that detail isn't recorded?" Well, there you have it. We'll see what the judge makes of it in several months time in his next judgment. Ms Phillips certainly knows her mind and was a forceful presence in the witness box. It was useful to see the exchanges unfold. There was a heck of a lot of to-ing and fro-ing between the Post Office's Angela van den Bogerd and Patrick Green, QC for the claimants in the morning. Whilst Mr Green scored a few points I come back to what I felt when I was watching Mr Roll be cross-examined last week. Where is the smoking gun? This trial is, yes, a trial of the Horizon system, but unless the claimants can prove Horizon (rather than a failure to investigate) has left them out of pocket, they are going to have a hard time "winning". The Post Office asserts Horizon is robust. It almost certainly is, or it would fall over to the extent that customers no longer trust it. The problem is when the Post Office asserts that robustness means it doesn't need to properly investigate a discrepancy and can axiomatically blame a Subpostmaser. That, I think, is April's battleground. There have been hints the Post Office's IT expert has taken a very wide definition of "working as it should" to include manual error-reporting as part of that robustness. We'll see what the claimants' IT expert has to say. Do have a look at today's transcript if you want to explore further. Day 7 begins in just over 12 hours time!